Haven’t decided on a hotel yet? You can look at other available hotels in the Rhineland-Palatinate region with Booking.com. For centuries visitors have traveled to the Rhineland-Palatinate to breathe in some of Germany’s greatest natural beauty. Steep slopes covered in grapevines guide the eye to dozens of turreted, hilltop fortresses, catering to the fairy-tale world of beautiful maidens and the Nibelungen, which inspired composer Richard Wagner for his famous Ring cycle. The region boasts over 500 castles, if you care to count. Some were built to protect settlements; others were homes for nobility; and many were strongholds of the infamous robber barons. Romance aside, the Rhineland-Palatinate also reigns as Germany’s top exporting region. 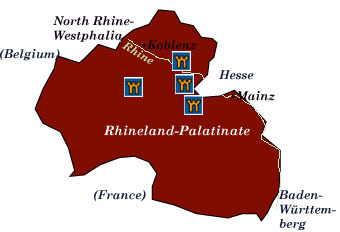 No small part of that is the tremendous amount of wine produced in the area—some 2/3 of all German wine. With only a few holdouts, every town and village celebrates their good fortune with a wine festival. The Rhine River Heroic and enchanting, the 65-km stretch from Bingen to Koblenz is an unforgettable journey into another world, as well as being designated a UNESCO World Heritage Site. Vineyard-covered hillsides, charming villages, and forty castles mark the way. The Mosel River Valley Travelers who like to explore small villages and taste the local wine will find that the Mosel River Valley offers everything the Rhine does, but on a smaller and gentler scale. The German section of the Mosel runs some 195 km from Koblenz to Trier, but for high scenery action the section between Cochem and Bernkastel-Kues is best. Castles galore! With over 500 castles in the Rhineland-Palatinate, where does one begin? A couple of magnificent examples are Burg Eltz and Marksburg castles. Trier Germany’s oldest city, archaeological excavations have turned up evidence of a pre-Roman Celtic civilization. By the 3rd century, Trier became the capital of the Western Roman Empire and home to Emperor Constantine. Trier has the most Roman ruins north of the Alps, gaining a place on the UNESCO World Heritage list. The lovely location and influence from nearby France make the town worthy of a visit.